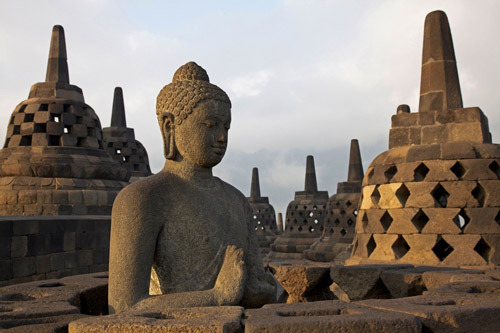 Some 2600 years ago, Prince Siddhartha Gautama, the historical Buddha (there had been countless others before him) was born in northern India. According to legend, a prophecy said he would become either a great king or a great holy man. Hoping for the first outcome, Siddhartha’s father had him raised in a walled palace, where young and beautiful companions and servants saw to his every desire. At age 29, the prince ordered a chariot driver to carry him outside the palace walls, where he saw an aged man, a sick man, and a corpse. The charioteer explained that aging, sickness, and death are the fate of all living beings. When the prince saw a yogi, and learned that he sought release from suffering, he determined to follow that path. For six years, he practiced austerities with a group of forest ascetics, but realized that even the most exalted states of consciousness did not offer what he was looking for. He sat beneath a bodhi tree, resolving to stay there until he’d unravelled the mysteries of life and death. During the final night, he withstood assaults from Mara, the lord of illusion, and experienced full awakening in the morning. He wondered if it was possible to communicate this truth – the Dharma – to others. Legend says that Brahma, king of the gods, appeared and begged him to try, and he did so for the rest of his 80 years. One Tibetan lama said, “Our suffering is like a child dying in a dream.” Everyone knows what it’s like to have such a nightmare and then wake up. As I understand it, all Buddhist practice aims at waking up in the midst of the very life we are living. That is plenty for now. In my next post I’ll address two other questions whose answers are also not obvious: is Buddhism a religion and is it atheistic? And then finally (I promise) I’ll get around to listing several books and web links on the subject. This entry was posted in Buddhism, Spirituality and tagged Buddhism, spirituality. Bookmark the permalink. “I am awake.” Wonderful post. It made me smile and think of al the wonderful art I’ve seen over the years, and now I know even more of the story behind it. Glad you enjoyed the post. I forgot to mention in the post that during his lifetime, Buddha was known as “the happy one.” Makes sense, when you think of the Dalai Lama, who is smiling in almost every photograph. 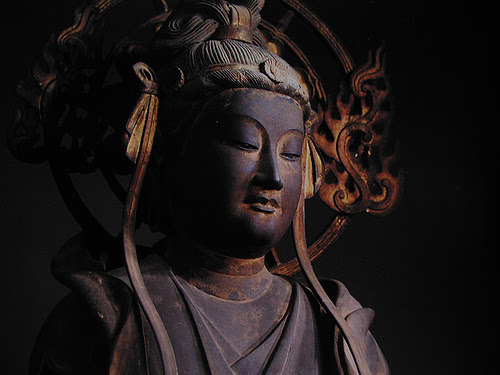 Perhaps for the followup post I’ll find one of those “laughing Buddhas” that show up in Japanese brush painting. Not as serious or reverent, but they make me smile as well. It’s been far too long since I’ve visited the Asian Art Museum in SF – maybe time to plan another trip! Perhaps I wasn’t thinking as much as I should have been when I asked my original question just how difficult it would be to answer. I find one of the easiest ways to learn about any complicated subject is to talk to someone who knows more about it than you do, and it makes it that much easier to start your own learning. It’s especially easy when the person you ask knows how to teach about the subject. I’ve enjoyed all of your posts about Buddhism and I’m really looking forward to the rest of these posts. Thank you again for taking the time to write these posts. Thank you for posting this, and I’ll look forward to the upcoming posts you mentioned! I’ve been interested in Buddhism lately because I know next to nothing about it, and it’s been hard to find descriptions that aren’t just confusing. I’m happy to hear of your interest. I’ve been enjoying a few lazy days over the holiday weekend, but the next post will come in a couple of days. Thanks for visiting. Nice post, Morgan. Very informative and interesting. I look forward to more. Thanks Rosi. After taking the three day weekend off, I’m back to working on it. Morgan, as a long time practicing Buddhist, I must say your post is both spot on and very informative. You have broken down some complex ideas in a way that is easy to grasp. Well done! I look forward to more of your posts. Thanks, and as a practicing Buddhist, I appreciate your comment. Those posts were ones I’d wanted to write for some time, but the usual doubts got in the way – I don’t know enough, can I say this right, etc. I look forward to additional comments you make.